Learn more about Peru and other countries in our daily postcard e-letter. Simply enter your email address below and we'll send you a FREE report: Peru - The Land of Incas...and Adventure. With its diverse landscape and unique history on display around every corner, Peru has much to offer. Towering mountain peaks, remote Amazon villages, seaside resort towns, modern cities…it’s all here. Up until now, Cusco, Machu Picchu, and the Sacred Valley have been the focus of Peru’s growing tourist industry. However, interest is now also increasing in other areas. One such up and coming location is Arequipa, the second largest city in the country. Arequipa sits at an altitude of almost 8,000 feet and its residents enjoy over 300 days of sunshine a year. Temperatures rarely go beyond highs in the 70s F and lows in the 40s F, so a sweater or light jacket is sufficient all year long. 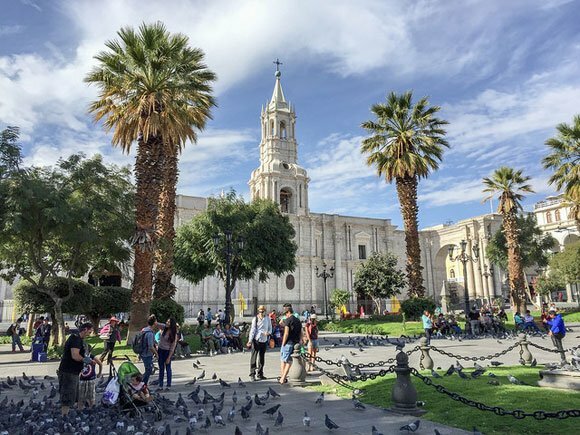 Arequipa is a city that has an almost spring-like climate year round. To the east, a series of volcanic cones dominate the city skyline—these are Misti, and the extinct volcanic groups Pikchu Pikchu and Chachani. The Chili River runs right through the center of town. Only 80 miles to the west is the Pacific coast with its expansive beaches, scenic resort towns, and the largest bird sanctuary in the country. Although the city has a metropolitan population approaching 1 million, it feels much smaller. The most popular areas to live, shop, and play are in and around the historical center of the city. Here you will find narrow streets, colonial buildings and churches dating back to the 16th century. The Plaza de Armas is considered one of the most beautiful city squares in South America. Arequipa also has several malls, numerous hospitals, grocery stores, cinemas, plus scores of restaurants. It’s a pedestrian-friendly city. Most expats do not drive but rely on walking, taxis, and buses. The average taxi fare is less than $3, but it is possible to walk to most day-to-day places. The Plaza de Armas and surrounding blocks were recently converted into a large pedestrian-only area. There are also plans to expand this walking area outwards in the near future. 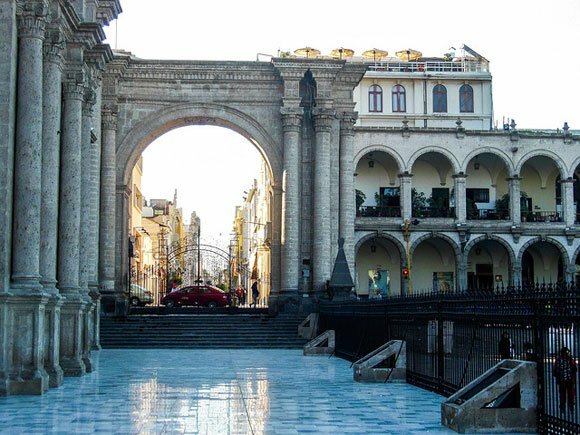 Historically, Arequipa has been the intellectual and artistic center of Peru. It is considered the best place in the country to purchase traditionally woven Alpaca textiles at bargain prices. Artisans produce fine leather goods, custom made guitars, filigree jewelry, and an array of other high quality products. There is still a relatively small number of expats in the city, mostly those involved in teaching or working in the mining industry. Recently, this has begun to change as more expats “discover” the city. In the past few months, several new expat businesses have opened and all are doing well. If you are interested in a city with a rich culture and picturesque colonial architecture close to a spectacular natural setting, you will enjoy retirement in Arequipa. And you will become part of a small, but growing, expat population who have decided that Arequipa is the perfect place for them to live. Certainly, Arequipa’s climate is close to perfect. With over 300 days of sunshine per year and a short rainy season, you can enjoy spending almost all your time outdoors. Shop at the huge San Camilo mercado for fresh produce and other local items at bargain prices, or visit one of the many modern supermarkets for more familiar items from home. All are within easy walking distance or a $3 taxi ride. If you love nature, Arequipa is a great place to live. The Salinas y Aguada Blanca National Reserve is a short drive from the city. Here volcanoes and classic high plateau countryside surround you. You will see vicunas, llamas, and alpacas freely wandering around and colorful flamingos in flight. Continue driving and you come to the Colca Canyon, more than twice as deep as the Grand Canyon. Less than two hours east of the city by car is the Pacific Coast and its beaches. Bird lovers will enjoy the Lagunas de Mejia National Bird Sanctuary located in a five-mile stretch of coastal marsh. For those interested in an active retirement, Arequipa is the hub for trekking in the nearby mountains and canyons. Sand surfing, fishing, and mountain biking are only a few of the other outdoors activities available. 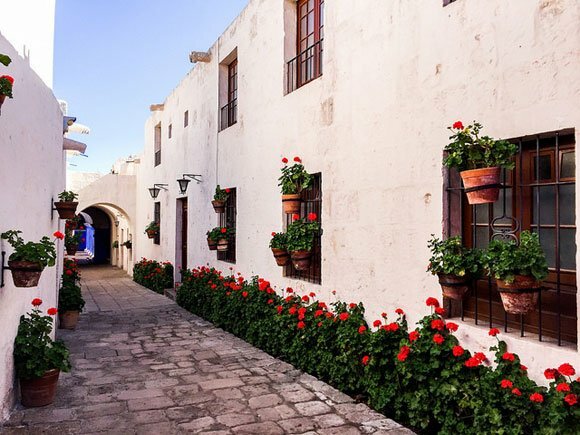 If your idea of retirement is a bit tamer, just walking around Arequipa’s lovely cobblestone streets is great exercise that invariably reveals new discoveries. There is also a large entertainment scene in the city. Night owls can dance the night away at one of the many clubs in town. The Municipal Theatre always has something going on, and several cultural centers in town regularly provide live entertainment. For larger shows that come to town, the huge UNSA Stadium provides seating for 60,000 people. It’s a far cry from Las Vegas but there are dozens of smaller casinos in town for those who want to while away a few hours trying to increase their retirement savings. 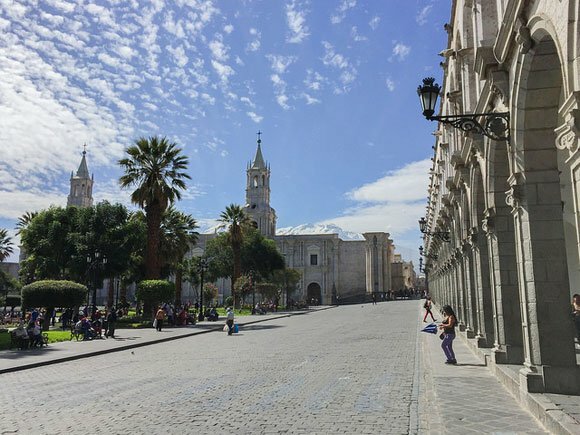 Proximity to the U.S. and Canada is another one of Arequipa’s pluses. A 90-minute connecting flight to Lima is less than $75. From there, you can find non-stop flights to Miami that take as little as six hours. Another appeal is the low financial requirements to qualify for a Rentista Visa, Peru’s answer to an expat Retirement Visa. Only $1,000 per month pension income is needed for the applicant and an additional $500 per month for any dependents. Within two years, you can apply for permanent residence or even citizenship. When living in Arequipa there is no excuse to ever be bored. Whatever lifestyle you desire, you’ll discover the city has many affordable options. You’ll find a multitude of cultural activities. Almost every week, there seems to be an excuse for another celebration. Parades, film and food festivals, art exhibits, and live music events are a way of life. Several malls offer first-run movies in English too. The Arequipa Symphony Orchestra also often provides free concerts at venues throughout the city. Speak to anyone in Peru and they will say that Arequipa has some of the best food in the country. The local picanterias offer traditional fixed menu lunches for less than $3. For a little more, you can enjoy great Peruvian cuisine at a variety of higher-end restaurants. In addition, the number of international restaurants is growing monthly where you can choose vegetarian, sushi, Italian, British, Chinese, pizza, and steaks, both beef and alpaca. You can enjoy a weekend away from the city in the picturesque Colca Valley. Visit ancient Inca ruins, relax at a resort with hot springs, or hike or tour Chivay and the other historic towns scattered through the valley to get a snapshot of traditional Peruvian life and customs. View magnificent condors soaring in the updrafts of the steep canyon walls. If you are more in the mood to stick around home, have a coffee with friends at one of the many cafés or bakeries in town. Arequipa is a baker’s paradise. Freshly made cakes, breads, and other treats adorn shop display cases on every block. And let’s not forget the huge assortment of local wines and cheeses available everywhere. Real estate in Arequipa reached a high a couple of years ago with a booming economy and mining industry. With a slowdown in the mining industry for various reasons, property values have recently decreased. For those thinking of investing in the city, now is the time to do it. Property values are predicted to increase in the next few years as new mining developments take effect within a couple of hours of the city. Foreigners have the same right to own real estate as locals, and the purchase process is fairly straightforward. Be aware, however, that mortgages are not generally available, so the full purchase price will be needed to complete the transaction. Most residences in Arequipa are fairly large. It is difficult to find small studio condos. Much more typical are two- and three-bedroom apartments, houses, and townhouses. Spacious, unfurnished rental apartments start at $350 per month. Completely outfitted condos go for $600 per month and up. Real estate in Arequipa is certainly affordable, especially once you move away from the historic center and popular areas such as Cayma and Yanahuara. You can find smaller two-bedroom apartments for as low as $65,000 near the large Plaza Aventura, Arequipa’s largest and most modern mall. In more upscale Cayma, you can still find large three-bedroom condos for $150,000 or less. Here you are in a safe neighborhood and within an easy walking distance from the historic center of the city. Plenty of interesting shops and a variety of restaurants are nearby. The living costs in Arequipa are low. You have a choice of shopping at several modern supermarkets scattered throughout the city. You will pay less at the large traditional market, especially for fresh fruits and vegetables. As well as the low-cost set menus at the local picanterias, street vendors provide cheap eats wherever you go. At the better restaurants specializing in Peruvian cuisine, you will still pay less than $10 per person including drinks. And you can enjoy fine dining at the high-end eateries for a fraction of what you would pay at home. The other major expense not included in this table is healthcare insurance. Although this will vary considerably from person to person, cost for basic private healthcare starts at about $300 per month. In this short video, Steve LePoidevin, IL’s Peru Correspondent takes a brief look at life in this high-altitude city. He and his wife spent their first year in Peru living in Arequipa before they moved to the northern coastal town of Huanchaco. Learn more about Peru and other countries in our daily postcard e-letter. Simply enter your email address below and we’ll send you a FREE report: Peru – The Land of Incas…and Adventure.